Subscribe to Kanelstrand to get updates on more eco DIY projects. The trees are blooming, the birds and the bees are busy filling the air with hums and chirps and what a better moment than this to share 3 crochet patterns to make the inside of your home even sunnier! 1. Birdie Decoration by Lucy of Attick 24. 2. Jar Cozy by Carina of Carina's Craftblog. 3. Cocktail Coasters by Kirsten of Through The Loops. I love how quick, easy and effective those tutorials are, so suitable for a leisurely weekend project! What are you creating today? Thanks for sharing these fun patterns! They are so cheery & fun! Maraley, they really take up such a short time! You should try them! Yay, I'll have to go and check them out, especially those coasters ~ adorable! :) Still trying to figure out the whole crochet pattern thing, wish me luck! Simply Smitten, It took me two tries to start loving crocheting! Just be patient and you will see it's even easier and faster than knitting. By the way, there are some great tutorials on YouTube. These are so pretty and cheerful! I really need to learn to crochet. Those birds are too cute! The colors are great. HarmlessColor, I love the "yet" part! Love that bird pattern. Trying to stitch a bracelet today but keep getting distracted by the internet. 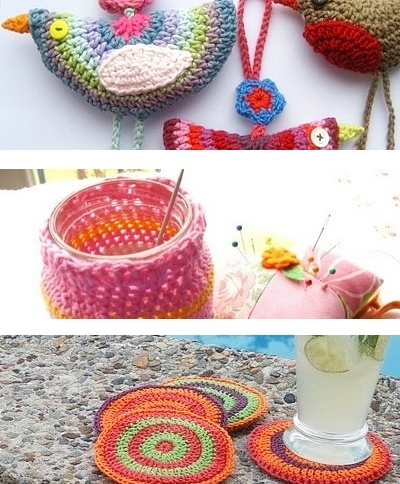 I love, love, love your little crocheted things! Those birds are adorable and I love the colors you put in the coaster. Too cute!! Giveaway Winner Announced And a Discount!